I'm not going to dwell on just how poorly my races went this weekend. I'm blaming it on bad luck and being sick but mostly recognizing there is still a lot to learn on my part. I'm motivated to correct things as the season goes on. Also, if you haven't tried the Clammy Cross series, you are missing out. Great venues, great people putting on some very cool races. The Night Race was so great. The course was short but had some great features including a steep run up, singletrack, smooth grass, 5 barriers, a lot of tight corners, all while racing under the lights. It was fun to mix it up with Bob, Mark, Ben, Grizzly and others. Waking up on Saturday, I didn't feel good at all but I promised Seth I'd take him to race his first bike race. He wanted to try a true CX bike so the good folks at Canyon Bicycles hooked him up with a loaner at no cost. The UTCX cross out cancer ride/race was going on at Wheeler Farm. The pre-ride and some last minute coaching. Then it was my turn. I lasted about 3 laps before pulling the plug. I had no power and had a hard crash on the gravel road which left me pretty frustrated. O well. That's racing. Just chalk it up to a bad week and bounce back I guess. Rachelle snapped a few pics. Seth and Dad in the pain cave. Turns out, we both like to ride with our mouths open. This is exactly the kind of fortune one would hope to get before race day (or in this case, race night). My interpretation goes something like this...."Don't get such a sucky start and you may have a shot at a top 10 finish". 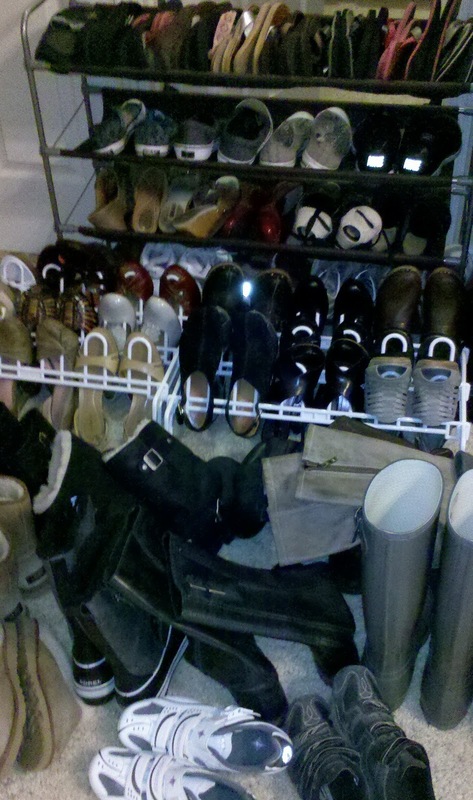 Somewhere in this pile shrine, are Rachelle's "Leadville Shoes" or her "24 Hours of Moab boots". Any major biking road trip/race, usually ends up costing me more than just the race entry and hotel expenses. There is the shoe expense too. Behold.....I counted about 60 pair, but I'm sure there are more. I didn't do Leadville this year. I didn't do 24 Hours of Moab. I'm getting smarter in my old age. These one hour cross races with less expensive entry fees are the future. 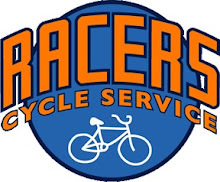 And with Rachelle just coming back from a 4 day girls trip to So Cal, I may end up getting the hall pass to race the Clammy Night race on Friday and the UTCX on Saturday. Maybe. Fort Buenaventura, Ogden- The best cx conditions and best course so far this year. By the time the A's and A 35+ flight left, the course was tacky and not too muddy. I hope by racing up I'll be able to dial in this cx thing before end of the season. Fitness is there, but there is so much more to this stuff than fitness. The view from my driveway this AM. This is going to be cool. Oct 21st. CX race under the lights. 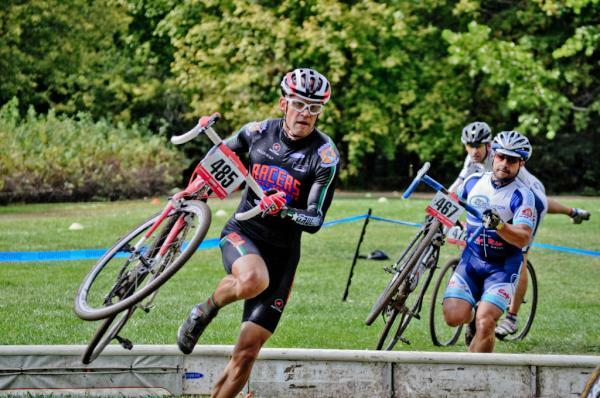 The UTCX season kicked off on Saturday/Sunday at the Utah State Fairpark. Here is a sample of the action. I switched from racing SS to the A 35+ group. Every week is going to be a fight to stay near mid pack. And you know what....? I'm okay with that. The course on Saturday had a lot of turns. A lot of tight, 180 type turns. I spent the entire race in my smaller chain ring and a few gears over from granny. It was all about bursts of power out of the turns. Totally flat. I suffered and never really figured out some of the corners but I loved it. I even busted out my superhero skinsuit. If you can't ride fast, at least look fast. Next week, we go to "O" town. Conditions should be wet and muddy. Perfect.